A4 version - http://www.wsm.ie/attachments/oct2008/health.pdf2nd ed. The healthcare system, upon which people in Ireland depend, is an apartheid system. Simply put, some lives are worth more than others. Rare attempts at reform have been stymied by historic, chronic underspending and vested interests. This legacy has forced the vast majority of working people to take out private health insurance and has laid the foundations for a neo-liberal push towards an American-style system of private, for-profit medicine. Despite the “economic miracle” called the Celtic Tiger that has led to Ireland having a higher GNP per head of population than much of the rest of the EU, it lags behind in terms of public health. At age 65 we have the lowest life expectancy in the EU for both men and women. Indeed, the gap between Irish and EU life expectancy has been widening. Infant mortality rates are above the EU average. We have above EU mortality rates for cancer and coronary heart disease. Despite Ireland’s incidence of breast cancer being among the lowest in Europe, the death rate from breast cancer was one of the highest in EU15. To cap it all, we have a widening income gap, which will of itself worsen the situation since greater inequality leads to higher mortality rates. This state of poor health of people in Ireland, especially when analysed on class lines, is a direct reflection of the unequal and inaccessible nature of the Irish healthcare system. The barriers to accessing care, in terms of availability and cost, mean that the level of health education and preventative medicine is severely low and that treatment for illness is often too little, too late. The cost of private care, means that many people must wait long periods, sometimes too long, for the diagnosis or treatment they require to survive. Apart from the super-rich and those with vested interests, everyone accepts that change is needed in the Irish health system. Increasingly, this change is seen to need to be radical and fundamental. However, one of the biggest mental barriers to campaigning for such change is the false perception that the problems with the Irish health system are impossibly complex and unsolvable. "Haven't we been trying for years, and it still doesn't get any better". Sadly, the problems are quite straightforward and we haven't been trying for years. In fact, a combination of political sabotage and complacency coupled with the self-interest of hospital consultants and the medical establishment has ensured that our health system has become increasingly more unequal and more inaccessible. This has created a sense of apathy and disempowerment among people on an issue which directly affects each and every one of us. The vision of an equal and accessible health system where waiting lists are a distant memory from a barbaric age, where preventative primary care is paramount and where hospitals are a place to get better rather than a place to die seems like utopian dreaming from a far away land. However, the aim of this pamphlet is to demonstrate that this equal and accessible health system is closer than we might think. In school, when faced with an issue, we were taught to analyse it with the "5W + H questions" - What?, Where?, When?, Why?, Who? and How? By analysing why change is needed, what change is needed, who can create this change, when and where change can be created and how we go about creating this change, we hope the reader will be empowered to organise to bring about change and not to wait, on a waiting list, any longer. An equal and accessible health system for all the people in Ireland is closer than we think. We hope to show how we can reach out and grasp it and never let it go. Cost is the biggest obstacle to receiving medical care, be it just a check-up or some more necessary treatment. Figures for the beginning of 2007 show that there are currently 1.2 million people with medical cards . This represents 28.9% of the population. There are a further 51,000 people with “GP-Visit Cards” which qualify them for free medical consultations but no drug costs. This is actually a remarkably high proportion considering that any single person under 65 years of age and living alone has to earn less than €184 per week to qualify for a medical card . Given that unemployment allowance (i.e., dole) payments are now up to €197.80 per week and that even on the minimum wage of €8.30 per hour, one would only have to work 22 hours a week (the equivalent of a part-time job) to surpass the income threshold, it is surprising that any worker is entitled to a medical card. Without the medical card, GP visits cost on average approximately €40, while being higher in urban areas (especially Dublin). These fees act as a strong disincentive to access medical care in two important ways. Firstly, they act as a deterrent to seeking out any sort of health education or preventative examination from a GP. It is commonly accepted that preventative medicine, such as cholesterol tests and smear tests, are fundamental in improving people's life-expectancy and quality of life. Secondly, they discourage people from seeking treatment when they are suffering from an ailment, instead waiting to see if the illness gets better or worse before reaching into their pocket to shell out at least €40 . Not acting in a timely manner in relation to disease is a common reason for more serious complications to develop. Given the low level of medical card entitlement in Ireland, it is not surprising that about 49% of the population purchase medical insurance each year from VHI, Vivas or Quinn Insurance (formerly BUPA). This costs between €119 and €143 per year for basic GP cover, between €360 and €422 for minimal hospital cover, and up to €1800 for specialist treatment. Despite already funding the health system through the tax system, 49% of people are forced to pay these sums to access adequate care. Of course, this leaves approximately 21% of the population who are not entitled to the medical card and cannot afford health insurance. They must fork out €40 for each GP visit and €65 for every night they spend in a public hospital bed (if they can get one), not to mention the other fees accruing. These people, PAYE workers for the most part, although paying their taxes, simply have no meaningful access to medical care in Ireland. Accessing treatment in a public hospital as a public patient is usually a test of patience and endurance. Ireland has 4.85 beds per 1,000 of population while the EU average is 6.3. Ireland has 3 acute hospital beds per 1,000 while the EU average is 4.1. There is no common waiting list to access these beds. Consequently, public patients may wait years for treatments which private patients may receive within weeks in the same publicly funded hospital, irrespective of need. It is a rationing system based on ability to pay. Ultimately, these forms of inequality and inaccessibility for those that need care in the Irish Healthcare System are caused by an unwillingness to invest. Primary care has never been emphasised by any government in the history of the state in terms of funding for equipment, buildings or staffing levels. For this reason, the level of health education and preventative medicine being performed is chronically low. GPs routinely refer patients onwards for procedures which are within their competence and which they could perform in a well- equipped local surgery. As a result, a disproportionate amount of medical care takes place in hospitals, putting them under undue pressure. Likewise, Irish hospitals have been historically massively underfunded, meaning that we have a lower bed ratio per head of population than any of the EU15 countries. The Minister for Health, Mary Harney, and her colleagues in the neo-liberal Progressive Democrats Party trumpet the fact that Ireland is now spending more per head of population than other OECD countries. However, in 2003, economists Dale Tussing and Maev-Ann Wren calculated that in real terms, current expenditure on health per head was less than 90% of the EU average. Moreover, this comes on the back of 30 years of neglect. Over the 27 years from 1970 to 1996, Ireland invested on average each year 63% of the EU average (capital expenditure). As recently as 1990, Ireland was investing 38% of the average. An increase to 90% of the EU average is clearly not enough to compensate for those decades of running down the public health system. * Ireland has 22 doctors per 10,000 of population. The EU average is 33. * Even if all of the consultants due to be appointed are employed, bringing the number of consultants up to 3,600, we would still only have 9 per 10,000 of population, half the level in Finland. * While the Government boasts of Ireland's 'knowledge economy', medical records have yet to be computerised in many public hospitals. In recent months, a cap on further employment of health workers has been reinstated due to the HSE going over budget for 2007. (It's worth noting that the reason for this overspend is that the hospitals simply treated more patients than the accountants were willing to allow them to) As a replacement, hospitals have been hiring agency workers on temporary contracts. Instead of employing a health worker in a full-time position, including the benefits (pension, health insurance, etc.) that this entails, they take on temporary workers as they need them, paying a premium to the recruitment agency for the convenience. Given the need for more staff in all areas, and given the increase in the population in Ireland in recent years, this will cause greater and greater problems and means meaningful planning for the future is impossible. In 2008, the HSE is to receive nearly €370 million less in funding from the Government than it maintains is necessary to sustain existing levels of service. 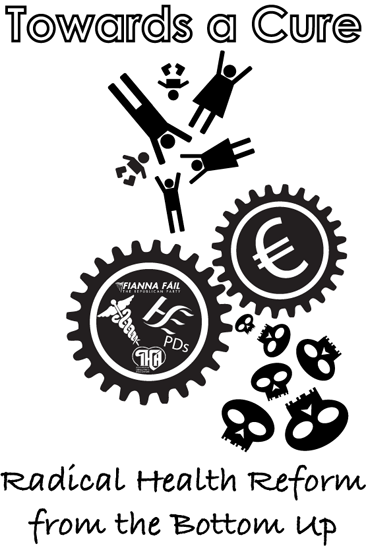 Many of the day to day blunders and terrible tragedies that we experience in the Irish health service are created by the problems of its hierarchical organisational methods. That is, in every area of the health service there is a strong division between order givers and order takers. This problem is endemic in the entire medical apparatus. The ethos is illustrated by the axiom “a consultant knows better than a GP who knows better than a nurse who knows better than a porter”. Therefore, coal-face workers, those that are at the front line of providing medical care, especially nurses, have no voice in how decisions are made about the provision of care. There is nothing democratic about these workplaces. In terms of implementing policy, the HSE, for the most part, make the decisions. As for the everyday decisions in our hospitals, the consultants are king, answerable to no one. Nurses and junior doctors are simply expected to obey. When they voice objections they are ignored or silenced. Despite the fact that they are the ones that are directly aware of the concrete issues and the nature of what’s wrong on the ground, their position is simply to take orders, do their work and shut up. This state of affairs is exemplified by the case of the death of Patrick Walsh in October 2005 in Monaghan hospital. He died essentially due to the fact that Monaghan hospital was left looking after him when it no longer had the means to care for him. He should have been transferred back to Drogheda or to Cavan hospital but when it came to it they said they couldn’t accept him. Those attending him at Monaghan hospital said the problem was ‘happening all the time’ and they regularly warned of it leading to a tragedy. They were ignored, being merely lowly serfs in the world of healthcare hierarchy. Then the tragedy did happen. The importance of cases like the Patrick Walsh is that they highlight how health workers are both aware yet silenced by the current order. Fear is an important factor in this, especially in the case of junior doctors. They are dependent on their master, the consultant. They need his/her training and reference in order to progress in their own careers. One displeasing word to the consultant can and does mean the immediate destruction of all job prospects in the Irish health service. Such hierarchy also creates a strong sense of malaise and unhappiness in workers, whether they be nurses or clerical workers in the HSE. Daily criticisms of the Irish health service, stemming from the mismanagement of a system that is deliberately underfunded in order to fail, can hardly lead to high levels of job satisfaction. The only escape from taking orders in this system is to be promoted to become an order giver. Having spent years resenting being forced to take such orders, the prospect of subjecting your fellow workers to the same misery is hardly an appealing vision. GPs are self-employed. Generally, they practice on their own premises (often a converted room or two in their house) and view their practice as a private company where they charge what they like. They tender to receive a list of patients covered by the medical card, for which they receive a “capitation”, that is a set fee per patient depending on their age, gender and distance from the practice. This capitation is relatively low (approximately €120 per annum on average for people under 65) so they generally supplement this income through private practice. For this reason, GPs do not setup a practice in predominantly working-class areas with high rates of unemployment. These communities must go without a doctor and are forced either to travel to the nearest GP or to the nearest hospital. Given that they receive far more money, proportionally, from private patients, given that they can charge per appointment and relative to the treatment given, they naturally have an incentive to focus their time and energy on their private patients. As they are self-employed and often exist as virtual monopolies, there are few incentives to expand their practice to include a larger range of services provided by a team of health workers using state-of-the-art equipment, something which would provide a holistic approach and optimal healthcare for patients. In addition, in the GP contract there is no stated minimum level of service, no incentive towards maximal service, and no mention of preventative procedures. Quality of service can therefore not be expected. Consultants' permanent contract allows them to earn between €143,000 and €186,000 per year for being present in a public hospital for a mere 33 hours per week. During this time they are under no obligation to treat their public patients but can treat their private patients who happen to be in the same hospital. If secondary school teachers were allowed to take private classes or give grinds during the school day instead of going to their scheduled classes, the inherent contradictions, vested interests, potential abuses, inequitable outcomes and unfair costs would be visible for all to see. Not so with the consultants. Neither do consultants provide the majority of care in public hospitals instead delegating it to Non-Consultant Hospital Doctors (NCHDs), also known as Junior Doctors. The consultants are the specialists with the training required, yet they do not provide it in many instances. Of course, consultants provide treatment in person for private patients. The consultant contract is such that the work balance the consultant strikes between emergency/elective, private/public, and teaching/research is none of the hospital's business. Consultants are not accountable to anyone, either administratively or clinically. Finally, the serf taxpayer foots the bill for malpractice insurance, picking up the tab even for consultants working in private hospitals and clinics over which the state has no control. No other profession in Ireland enjoys this level of state subvention (i.e., welfare for the rich). The medical institutions, such as the Royal College of Surgeons, the Royal College of Physicians, the university medical faculties and the Irish Medical Council, have enormous power in the Irish health system. They control the training of health workers, having carte blanche to draw up their own curricula and also decide which hospitals they will recognise for training purposes. Their decisions fix the capacity of hospitals to produce trained consultants. They also fix the capacity of hospitals to provide medical services for their communities as hospitals depend on medical trainees to man their services. A royal college's refusal to recognise a hospital for training purposes amounts to a death warrant. The Medical Council is the governing body of the medical profession. The Minister for Health is entitled to appoint just 4 out of a 25 person Medical Council. Private medical bodies, such as the royal colleges and university medical faculties, control the other 21 seats. With general practitioners given only 3 seats on the Medical Council, the regulator is weighted heavily in the direction of specialities and academics - the forces that still drive the services today Just one member of a fitness to practice committee represents 'the public interest'. Having described some of the more glaring institutional problems in the Irish Healthcare System, a brief examination of some of the current issues is illuminating in seeing where mistakes continue to be made and where the system may be heading. The spin broadcast about this policy was that it was to buy treatment for public patients from the private sector (either in Ireland or abroad) in order to cut waiting lists and waiting times. In reality, it has created an odd circularity in policy: private patients are given preferential treatment in public hospitals, and the public patients whom they displace may in turn be treated in private hospitals. This is neither an efficient use of public money nor an equitable way to treat patients. One particularly bizarre statistic is that 36% of all procedures carried out under the NTPF occurred in the same hospital the patient was referred from - that is to say that the consultant is getting paid an additional private fee to treat a patient s/he is supposed to be treating anyway! Liam McMullin, a surgeon at Roscommon Hospital, made the point that the hospital had spare capacity during 2006. 'Curiously enough, 50 miles away in private Galway hospitals, public patients are being treated by the NTPF scheme, services we could deliver here at Roscommon'. Ultimately, the NTPF simply acts as a growth promoter for private medicine, stimulating both individual private practice and the private hospital sector - the real aim of it in the first place. In the mindset of 'private good, public bad', the PDs came up with the Trojan horse policy of co-location. The spin was that it would create 1,000 private beds in the hospital system, thereby freeing up beds in public hospitals. This is to be achieved by inviting private investors to build an extension to a public hospital, defraying half the cost of the build, allowing the new private wing to be staffed with medical consultants poached from the public hospital, and guaranteeing the viability of the enterprise - and the profits of investors - by enabling streams of public patients to be rerouted from the public hospital. This policy would be objectionable enough if it simply amounted to the giving away of public land and the waste of €500m on tax-breaks to the private sector. What makes it a more fundamental crossroads is that it will institutionalise two-tier care in the Irish healthcare system. It would be difficult to reverse or reform this system if it goes ahead. Indeed, these private hospitals will be dependent on a second-rate public health service to survive - depending on treating public patients that the State is paying these private operators to treat under the National Treatment Purchase Fund. Worse still, it is a terrible way to increase bed capacity. Most of the 1,000 beds to be freed up were occupied by patients who had been admitted as emergencies and could not, therefore, be transferred to private hospitals: for-profit hospitals don't have the staff to care for the diverse needs of such patients. Casualty is too costly to be profitable. When private hospitals have emergencies themselves, when their patients become very ill, they transfer them, speedily, to public hospitals, where they can be looked after by specialist nurses and doctors, who are employed in sufficient numbers to provide round-the-clock attention. Therefore, co-location will simply add 1,000 beds to the for-profit sector. This will increase the proportion of money-making hospital beds in ireland, excluding psychiatric and long stay, to a national minimum of 42%. This is 3 times the proportion that exists in the US! Of course, this was the intention all along. Investment advisors classify co-location as the first step - in an eight-point scale - in privatising a nation's health care system. Those who had most to rejoice in this plan were not the cancer sufferers or the diabetics in our midst; they were the millionaire builders, bankers, developers, investors, financiers, advertisers, auctioneers, solicitors, and PR consultants, who needed no reminding of their excessively good fortune. Originally, the spin behind the introduction of a new consultants’ contract was an attempt at much needed reform. Firstly, it was to bring back the public-only contract, whereby consultants may only treat public patients. Secondly, it was to start the process of doubling the number of consultants in the Irish healthcare system, something which has been recommended for a long time . Thirdly, consultants were to be expected to work in teams around the clock reducing current reliance on NCHDs. Of course, considering the fact that the contract was to upset the status quo, the vested interests of the consultants have been given some substantial sweeteners in order to get them to accept the deal. The deal finally agreed between the HSE and IHCA offers a new salary of up to €240,000 - an enormous salary for a mere 31 hours a week of public hospital work. Not only that but the IHCA watered down the restrictions on private practice, leaving it more or less untouched. Why would any consultant take a public-only contract, thus removing his/her ability to earn considerable sums from treating private patients, for a mere salary reduction of €20,000?!?! Night time consultant cover was also removed from the deal. Weekends will be covered for "a number of hours". Finally, increasing consultant numbers at this salary level will be a huge drain on public finances. It is estimated that if consultant numbers are doubled at these salary levels, that it will consume one eighth of the entire health budget. Of course, the entire charade of the negotiations between the Government and the IHCA was always going to end up in such a deal. With the same class interest, the Government were never going to stand up to the consultants in the public interest and force them into a massively unpopular strike. The negotiations were merely a time-wasting device so that the Government could be seen not to give in to their fellow members of the elite too quickly. The main cause of congested A+E wards is that old people and mentally ill people are forced to stay in A+E beds because there are no facilities to transfer them to. The government has been using tax-incentivised private nursing homes as the way to create some of this extra capacity rather than investing in public nursing homes. The reason that it is such an issue in the media, in comparison to other problems in the health service, is that it is the only place where private patients must wait in line with public patients and experience the long delays and low standards of care. The existence of MRSA in Irish hospitals has 3 causes: overcrowding, overworked hospital workers and the outsourcing of hospital cleaning. Overcrowding contributes hugely to hospital infections, allowing bugs to jump more easily from one patient to the next. Yet the Government's refusal to spend money on beds means that hospital infections cannot be dealt with effectively. In the 1950's Noel Browne introduced sanatoria in order to isolate patients with TB. This was key to eradicating the problem in Ireland. Such isolation rooms are not present in Irish hospitals with MRSA. Nor is the funding forthcoming. However, every patient who has contracted an invasive infection costs a multiple of a non-infected person. Up to 5% of total hospital budgets goes on treating infections that patients catch in hospitals. In 1999, for example, hospital infections cost the NHS in England alone an estimated £1 billion. Effective infection control could save up to €50 million annually in Ireland. Enough to buy 50-100 beds, depending on how they are priced. Few public hospitals, if any, employ their own cleaning staff. If hospitals are dirty, it is partly because their cleaning has been contracted out to private cleaning firms. These cleaners are temporary, their contracts insecure, their benefits and their pay low. Under these circumstances, workers are unlikely to give of their best. Every hospital in Northern Ireland, bar one, has now switched from outsourcing cleaning to employing staff in-house. Although dated at this stage, the Hanly Report is the foundations of the move to close down regional second-level hospitals in favour of large, urban hospitals. The effects of this have been gradually felt across rural Ireland in the last 8 years. As recently as 31st January 2008, proposals to significantly cut services at hospitals across the northeast region were reported to have been drawn up by the Health Service Executive. This drive towards the centralisation of hospital services is based on the false assumption that Ireland has the same demographics as Britain. The Hanly Report was based on British population densities, thus informing its conclusions that regional hospitals needed to close as they didn't have a sufficient population base and thus could not guarantee safety. Of course, this is a nonsensical idea. Britain is far more urbanised than Ireland. Indeed, the idea of safety had been turned on its head. It is universally acknowledged that the "golden hour" for an emergency patient to get to hospital is critical in terms of rates of survival. In Ireland, "dead on arrival" rates vary from 23% for city folk to 74% for small-town dwellers. The vast bulk of surgery and medicine carried out in smaller hospitals does not require large numbers for good outcomes. Only larger hospitals do the kind of complex surgery that requires larger volumes for optimal results. Furthermore, 90-95% of problems that patients present to county hospitals are well within the competence of their surgeons. They suffer from the common or garden maladies that afflict everyone - heart failure, pneumonia, gall bladder, and appendicitis to name but a few. Why, for the sake of the 5% of cases outside the capacity of smaller hospitals, should the inestimable benefit of access be removed from the other 90% and at a far higher cost? Indeed, only five procedures show a link between volumes and outcomes: surgery for cancer of the throat and pancreas; child heart surgery; surgery for an unruptured aneurism (haemorrage) of a major blood vessel (the aorta) in the abdomen; and the treatment of AIDS. These procedures are not done on an emergency basis; nor are they usually carried out in smaller hospitals. Using them to make the case for closing county hospitals is wrong. Ironically, one of the arguments used in the Hanly Report to close smaller hospitals around the country was that Ireland had 'too many' of them, and that this was resulting in a 'costly duplication' of services. Now the Government is in the process of running down and closing smaller public hospitals, while building no fewer than ten new small co-located hospitals on public hospital sites (where they will do maximum damage to the public hospital system). Clearly, there was no shortage of small hospitals all along. There is no talk now of costly duplication, although the new private hospitals will offer to precisely the same population exactly the same medical services, in many cases, as their public hospital neighbours. Competition is the name of the new unspoken game, the creation of an internal market. Not only that but with vast extensions needed to double or treble the capacity of those hospitals that remain post-Hanly, closing the country's specialist and second-level hospitals would certainly trigger a building boom. Moreover, a sea of hospitals coming on to the market at knock-down prices will be a developer's dream. Closing Dublin's single-speciality hosptials, for example, will release a tidal wave of extremely substantial properties in prime locations, in Hume Street and Temple Street, for example. The National Maternity Hospital overlooks Merrion Square, one of the prime sites in the city, while the Rotunda Hospital, one of Europe's oldest maternities, would make a perfect city-centre five star hotel, rivalling the Victorian red and gold bricked splendour of the Eye and Ear Hospital in Adelaide Road. So basically the Hanly Report and the drive to close down regional hospitals treats people living in rural areas, in towns and villages, as though they were some sort of unrepresentative and unimportant minority. As HSE CEO Brendan Drumm said, "People unfortunate enough to live in non-urban areas will just have to get used to it." When you consider that non-urban communities are expected to pay the same taxes as everyone else, taxes that are being gift-wrapped and handed over to the already rich developers of co-located hospitals, and that they are expected to accept, at the same time, that their access to publicly funded hospital services is far less, this policy emerges from the spin as a blatant form of class war. While public patients will suffer most under the planned acceleration of the two-tierred system in Ireland, even those who hold private health insurance stand to lose. The boom in for-profit health care means more tests, more procedures, and more 'bed nights'. More costs, in a word. Subscribers will inevitably face bigger premiums. A rise of 30% in private health premiums over the next 3 years or so has been predicted. Whatever the actual rise, the increases are sure to be substantial enough to put private health care out of reach for many. And as competition between private hospitals increases, the costs of healthcare will get even higher as these hospitals waste money on marketing and paying out large dividends to their shareholders. For every €75,000 invested in the for-profit sector, investment promoters forecast a profit of €62,760. This is an extraordinarily high return, almost 84%. Private health care is hugely profitable. Croft Nursing Home in Inchicore, Dublin, for example, made a profit of €350,000 in 2003. In terms of health insurance in a private health system, premiums inevitably spiral upwards. The cheaper a health insurance premium is, the more people will buy it and the more likely they are to avail of medical treatment. But the more people are treated privately, the more it costs the insurer; and the more likely it is that the insurance premiums will rise. Private health insurance currently supplies most of the revenue to the private sector. As capacity ceases to be a limiting factor, insurance companies are going to have to find some way of limiting consumption. This is not consumption of medical services but consumption of insurance claims. So they will follow the US model by inventing a myriad of small-print clauses to render people ineligible to claim for a particular procedure, as seen in Michael Moore's film documentary, Sicko. Anyone who has seen this film can safely say that this is not a road we want to follow. We should retain our network of second-level hospitals, complete with 24/7 inpatient A&E and maternity care. Acute surgery should form part of urgent care; certain surgical procedures need to be available on an emergency basis 24/7 to prevent avoidable deaths. The consultant contract should be re-negotiated with a willingness to provide 24/7 cover as a minimum requirement for employment. Wages should be brought back to previous levels and a public-only contract the only one available. The policy of co-location should be scrapped immediately. No matter how far plans are advanced they should be rendered null and void. The National Treatment Purchase Fund (NTPF) should be scrapped and funding provided and capacity used in the public system. Funding should be provided, as a priority, for the necessary beds in the public system to bring us up to the EU average. The HSE should be broken up, responsibility returned to the Minister and Department of Health, and regional boards reinstated. Whistleblowers should be given protection to allow front line health workers to speak out against the problems in the system. The income thresholds for eligibility for the medical card should be increased so that 40% of the population are in receipt of one and this threshold should be indexed to the average industrial wage and inflation. There should be a common waiting list in all hospitals so that treatment is provided according to need rather than ability to pay. More students need to graduate in many areas - doctors of all types, children’s nurses, dieticians, chiropodists, radiographers and radiation therapists. Funding for the creation of places on these courses should be provided. Graduates should be required to practice in the Irish public system for a set number of years. There needs to be massive investment in the creation of capacity in public hospitals, and in nursing homes and community care to free up space in A+E wards. The GP contract should be re-examined so that they become public sector employees, paid a set salary, with incentives to work in deprived areas. A minimum level of service should be stipulated, incentives for a maximum level of service should be provided, together with an emphasis on preventative medicine. A ‘free and frank’ forum should be setup to allow health workers to voice their concerns and issues in the public health system. Medical card provision should be expanded to the entire population, providing a universal healthcare system, free at the point of access, to encourage preventative medicine. Private practice should cease in public hospitals. The number of patients per GP should fall under the 1,000 threshold to improve access for patients and improve the doctor/patient relationship. Waiting lists should be phased out by moving towards a booking system as they have in France. There, all surgery is planned under a booking system in which the patient is given a date for surgery immediately it is prescribed, although this may involve a few months wait. A modern primary care system, with GPs, practice nurses, public health nurses, physiotherapists, social workers and others working in teams from modern, well-equipped, computerised primary care centres in every community and large urban neighbourhood. Outcomes from the health workers forum should be implemented. How such reforms would be funded is an important question. The existing Irish tax-funded system could be reformed overnight in a Bevan-type manner  by introducing free primary care in which the state would pay GPs by salary, and by banning private practice in public hospitals and investing in public care so that the majority would opt to be treated in one-tier public hospitals by salaried consultants. This would be similar to the system in the UK or Denmark. The health insurers would revert to insuring a much smaller proportion of the population for elective care in the small number of private hospitals. Provided the state invested sufficiently in the public system, private medicine would lose its appeal. However, if the state did not invest sufficiently in the public system, there would remain a risk that patients and doctors would take flight into the private system and the chasm in Irish healthcare would deepen. And that is the fundamental question. As tempting as it is to simply say, “Tax the rich”, as the Socialist Party do, how do we guarantee future funding of the health service? How do we lock future governments into such a system and prevent them running down the American privatised route? No one really wants to have to run campaigns to defend the health service every time a right wing government is voted in. Universal Health Insurance (UHI) is an idea bandied about by diverse groups of people – Labour, Fine Gael, economists, etc. all of which have diverse (and generally less than equitable) ideas about how it would be implemented. In this system every citizen is obliged to be insured for their health care needs. It is a compulsory as opposed to a voluntary health insurance system. The state may pay these premiums directly, funding them from the central exchequer, or individuals may pay their own premiums, with the state paying for those on lower incomes. A third option, the system in France and Germany, is that the individual is insured through PRSI with both employers and employees contributing through payroll taxes. The state picks up the tab for those who are not in employment or on low wages (preferably, all those below the average industrial wage). This is a progressive route since contributions are proportionate to income and corporations are obliged to support health care as part of the social security system. A carefully designed universal health insurance system could deliver equity and a relatively dependable flow of funding. It can be seen as an earmarked, ring-fenced form of taxation. Consequently, society would perceive the cost of its health care preferences more transparently and could debate cost/benefit trade-offs more openly. If each citizen is insured to receive the same medical care and hospitals and doctors have no incentive to discriminate between them, then this is an equitable system. It would end the distinction between private and public patients. If everyone is covered by a premium then the fund for health care should rise as costs rise and in line with population growth. Health care funding should no longer be subject to the whims of the Department of Finance. These universal insurance-funded systems have consistently allocated a much higher proportion of national income and a higher per capita spend to health care than the UK's universal but tax-funded NHS. However, it is important that the such a system is not open to private insurers. Free market competition drives up costs. In the US where 13% of national income goes to health care, it has been calculated that the profits of insurance companies and medical care organisations account for one to two percentage points, one to two per cent that is of the entire income of the United States. Every television advertisement increases health care costs. Furthermore, provided that private hospitals continue to exist, the system should favour public hospitals except in cases where capacity is very tight. In conclusion, therefore, progressive funding options are available, provided they stick to certain principles. These funding options can introduce equity into the healthcare system and provide certain guarantees of funding into the future. It is long past time, therefore, to build a campaign which will launch a struggle for the soul of the health system in Ireland. In the ascendancy at the moment as is seen above is the right wing neo-liberal agenda driven by the current government and their friends in big business. This is the ideology that openly declares ‘Private good, Public bad’. It is an ideology that is unashamed about its belief that a profit can and should be made from everything. It is an ideology that believes in low taxes on wealth, leading to low public spending on services such as health and education. It is an ideology that is currently in the middle of a deliberate run-down of the public health system in order to open the way for even greater amounts of money to be made by the profiteers. Lined up on the other side of the battlefield should be those of us – patients, family members, potential patients, health service workers – who know that if we’re sick today there’s no point in being told that we’ll have a ‘world-class health system’ some time in the future. We believe that the provision of decent healthcare should not be dependent on the individual’s ability to pay. We believe that when someone is sick he/she should be able to access the very best of attention, expertise and care. The reality of the run-down is the public health system is faced on a daily basis in the hospitals and wards up and down the country. We saw with the nurses’ strike in 2007 that there is precious little appreciation by the HSE bosses for the work and effort of health workers. Instead accountants and financial advisors rule – and cutbacks are the order of the day. Sometimes these cutbacks happen in small ways but other times they are significant. Occasionally we hear about them in the headlines but for most health workers they are everyday issues that they have to contend with alongside doing their jobs. An example of one that hit the headlines was the manner in which hospitals in Dublin and Cork, to name just two places, were ordered to close wards and cut overtime and holiday cover in late 2007 so that ‘the year-end books could be balanced’. This order was issued by the HSE bosses despite the reality of big waiting lists in a wide number of the specialties where wards were ordered closed. Nurses at the time spoke out loudly about this disgrace. Another example – somewhat different but just as pernicious was in the new Cork Maternity Service, which opened in 2007. Here the consolidation and revamping of this critical service was used by Cork HSE management to push through new working arrangements for midwives which would result in less midwives attending more mothers to be. On that occasion in Cork, the midwives successfully resisted. But once again we see how cynical and money obsessed the bosses in the HSE are. For those of us who want to see a decent public health service built, it is clear that we have a major battle on our hands. The privateers are currently in the driving seat and if we are to wrest back control a massive broad-based and inclusive campaign must be built. To be successful in this ambition, there are a number of basic and fundamental questions which we must try to address in relation to bringing about change – the Who, the When and Where and the How. To answer this question, let’s first of all look at past history and let’s rule out the ways in which fundamental change will NOT come about. Firstly it must be clear both from Irish history and from the history of Europe that the sort of fundamental improvements that we are talking about will not come from government. The current Fianna Fail/PD/Green government and the past FF/PD coalition may be the most recent protagonists, but it is clear that no Irish government since the foundation of the state has been remotely interested in creating the sort of health system we are talking about. Rather all have been complicit in bringing us to where we are and in following the same two-tier model creating increasing inequality and subvention of private medicine. The unique combination of successive Irish governments and the Catholic Church has consolidated this increasing inequality and has both failed to face down the vested interests of elements of the medical profession, and increased centralised control of the health system. After the Second World War social movements across Europe forced governments into conceding various degrees of a welfare state. In Ireland, however, the Catholic Church’s vehement opposition to anything that smacked remotely of socialist ideas, and its desire to have the state’s laws reflect Catholic moral beliefs, meant that the southern Irish state never developed any tradition of social democratic politics. On the rare occasion when individual politicians or political ideas challenged the dominant status quo, it was shot down in a hail of righteous indignation. Perhaps the most well-known of these occasions was when then Minister for Health, Noel Browne, attempted to introduce what became known as the Mother and Child Scheme in the early 1950s. Browne’s proposal was that all children up to the age of 16 would be entitled to free medical treatment, and that free pre- and post-natal care would be provided for all mothers and newly-born infants. The combination of Catholic Church and the medical establishment would have been a formidable ally for a government which was convinced of the ideology of Browne’s attempts at reform. However, most of the government were only too willing to back down and the sight of their enemy lined up before them frightened the life out of them. Taoiseach John A. Costello made it clear “Whatever about fighting the doctors,” he told Browne, “I am not going to fight the Bishops, and whatever about fighting the Bishops, I am not going to fight the doctors and the Bishops”. From the early 1970s on, the ‘two-tier’ health system became firmly embedded. The 1970 Health Act introduced by Fianna Fail re-inforced this and political developments of subsequent decades have proven that this inequality of access is now an inherent characteristic of the system. And it has also been proven that real reform of the type that we would like to see will not be brought about by politicians. Even if they had the will to do so (and it’s unlikely that any of them ever will) the vested interests of the consultants’ bodies and those that are making huge profits from the current set-up will ensure that the status quo will remain. As far as protecting services in Monaghan hospital was concerned, electing Connolly was a waste of time. Indeed so lacking in success was he that on 25th September 2006 over 10,000 people turned up at a protest organised by the Monaghan Community Health Alliance at the opening of the new Monaghan town bypass to protest at the downgrading of Monaghan Hospital – just one of several protests that have been organised by the campaign to save Monaghan Hospital over the past number of years. Also elected as part of that alliance was Dublin North Central TD Finian McGrath who on his re-election in the 2007 election voted for Bertie Ahern as Taoiseach, and subsequently voted confidence in Mary Harney as Minister for Health and in her policy of privatisation and co-location! The lesson is that politicians – government or opposition, party members or independents – are incapable of delivering any meaningful reform. Maybe we should look to the trade union movement then? The problem here is that the leadership of the trade union movement in Ireland has become firmly embedded in the status quo through the mantle of so-called ‘social partnership’ which they have bought into in the last 20 years. It is in fact the cover given to them by ‘social partnership’ that has allowed the government to go down the privatisation road to the extent that they have. Since the first of the ‘social partnership’ agreements – the Programme for National Recovery – in 1987 right through to the current deal ‘Towards 2016’ the Irish Congress of Trade Unions has effectively been incorporated as an arm of government and – while they may be long on rhetoric, the trade union leadership is severely lacking in any meaningful action when it comes to opposing the drive to for-profit healthcare. We cannot rely on politicians. We cannot rely on trade union leaders. We should not, indeed, rely on any ‘leaders’. What we need is to build a campaign from the bottom up – a campaign which will rely simply on the ingenuity and honesty of ordinary people – of trade unionists, of patients, of family members, of health workers. We need to build a campaign which cannot be bought off or ‘incorporated’ - a campaign whose ‘leadership’ remains at grassroots level and which doesn’t allow itself to become a vehicle for the massaging of egos or the grooming of wannabe politicians. It should be a campaign which rejects both ‘partnership’ and electoralism as a means of bringing about change. They’ve both been tried and failed. What is needed now is a new approach – one which looks to the strength of street protest and the organisational ability of ordinary people as its principal strategies – a campaign aimed at forcing change from government. We should have learnt by now that the political establishment will not give in to us because it’s the right thing to do. They will do so when the combined weight, strength and determination of our campaigns leave them with no option other than to concede to us. This is no pipe-dream. The building of such a campaign is a realistic target for us to set ourselves. Already throughout the country communities have been organising and uniting to defend their local health services. From Tallaght to Monaghan, from Crumlin in Dublin to Castlebar in Mayo, from Dun Laoghaire to Sligo via Navan and in many many communities in between campaigns have brought hundreds and thousands of people onto the streets. The depth of feeling is incontestable. It’s clear that people care and that ordinary people want to defend and improve hospital and health services. Similarly, around the hospitals and wards there can be no doubting that there is both anger and resistance. Workers have spoken out on many occasions about the patent wrongs that they being forced to deal with by the HSE bosses. Health workers have time and again resisted so-called ‘reforms’ that are really about cutting services and balancing the books. It is crucial that this anger and resistance among health workers is galvanised and given a voice. In this respect a grassroots health workers’ network would be a huge and important step forward. Time and again, in community campaigns, we have seen people coming together to talk and share experiences. Such a process can be the basis for a move towards taking sustained political action. So it should be now for health workers. There is need to link up, to share experiences and ideas - this is the time for action. The challenge is to find a way in which all of these communities can forge links and bonds between each other, can federate and co-operate and can build a strong unified campaign which will frighten the living daylights out of government. There will always be local politicians ready and willing to jump on the bandwagon of these protests and campaigns. Indeed in some instances we have witnessed the sorry and almost comical aspect of government TDs supporting protests against local hospital closures. Hypocrisy is of course no stranger to the modus operandi of your average politician but the sight of Junior Minister at the Department of Health, Jimmy Devins, protesting outside the Dáil about the threatened closure of cancer services at Sligo General Hospital on 22nd November last year was probably the most blatant bit of hypocrisy seen for some time. "I am totally and utterly committed to maintaining the current level of service in Sligo General Hospital in relation to cancer services,” declared Devins , but there was no way he was going to resign his Ministerial position. Indeed so principled was his opposition to government health policy that less than one week later he dutifully voted full confidence in Mary Harney as Minister for Health and in government health policy. This is the sort of political hypocrisy and opportunism that must be rejected outright if a decent campaign is to be built. Government politicians should not be welcome near the platforms of any protest. Politicians from opposition political parties should also be treated with a pinch of salt. We only need to look at the Green Party’s 180 degree turn on issues such as opposition to U.S. military flights through Shannon airport, support for the Shell to Sea campaign and the Lisbon Treaty to realise that the whiff of getting their hands on a bit of power is enough to turn the heads of any politician and destroy any principles they might have. So the campaigns we aim to build at local level should avoid the hypocrites and the wannabe politicians. We should aim to build genuine open democratic local campaign groups in which everyone can have their say and which aim to bring together patients, family members, health workers and concerned trade unionists and community members. Campaign meetings should be held regularly and should be open to all. We should avoid setting up ‘leaderships’ or committees which will tell the rest of us what to do. But the campaigns cannot remain local. While some of the issues might be directly local in the sense that they effect a local hospital or service, the answers to the problem are national. Local campaign groups need to find a way to come together to share their knowledge and expertise in order to support each other, and to pool their anger the better to let the powers-that-be hear us all shout loudly together. The manner in which campaigns come together to unite their voices is important. In order to maintain maximum democracy, and again to minimise the opportunities for opportunistic groups or politicians to take control, the campaigns should federate from below. Mandatable and recallable delegates from each local campaign could meet on a regular basis to discuss issues of common interest, and to plan national activities. What this means in practice is that all issues would be discussed fully by the local campaign groups, that the delegate who the local group sends to the national meeting would then be given a mandate and that the delegate would report back to the local group for final decisions on anything controversial. To get to that point, establishing real local campaign groups is the first step. Many of these already exist around the country, although the extent to which some of them are free of the control of local politicians with their own agendas is sometimes unclear. We would however urge everyone who is passionate about the demand for a decent public health service to either join an already established local campaign group where you live or help to establish one. We hope that some of the ideas we’ve included in this pamphlet will be of some use to you in your efforts to do so. Building the sort of campaign that is necessary to fight for the sort of health service we deserve is no easy task. We’re talking here about taking the first steps in what will be a long and difficult road. But neither should the task be over-daunting. Fear of taking the first step, nervousness about whether we’ll get it right should not put us off. Rather we should be brave enough to take the first steps in coming together with like-minded people and starting the process. A medical card entitles the holder to free visits to a General Practitioner (family doctor) and free prescribed medication. The figure for a married couple under 65 years is €266.50 per week although there are additional allowances for children in the family. All people over 70 years of age in Ireland receive a medical card. Further costs would be added where minor surgery or prescription drugs were required. Drug costs are capped at €85 per month per patient. Of course, doubling the number of consultants is ineffectual if the requisite numbers of nurses and administrative staff are not there to support the expanded capacity. Aneurin Bevan was a Welsh Labour politician. He was the Secretary of State responsible for the formation of the National Health Service. How Ireland Cares: the Case for Health Care Reform, Maev-Ann Wren and Dale A. Tussing, New Island Books (1 Jun 2006). Emergency: Irish Hospitals in Chaos, Marie O'Connor, Gill & Macmillan, 2007. The Bitter PIll: An Insider's Shocking Exposé of the Irish Health System, Doctor X, Hodder Headline Ireland, 2007.